I have a Customer who is running Oracle DB on StorageTek 2500. He wants to have a check on the performances. Do you know what firmware it is running? It is probably Engenio sourced. Yes, OnCommand Balance does support the StorageTek SUN storage. It uses the Engenio SMIS provider. See the following instructions. 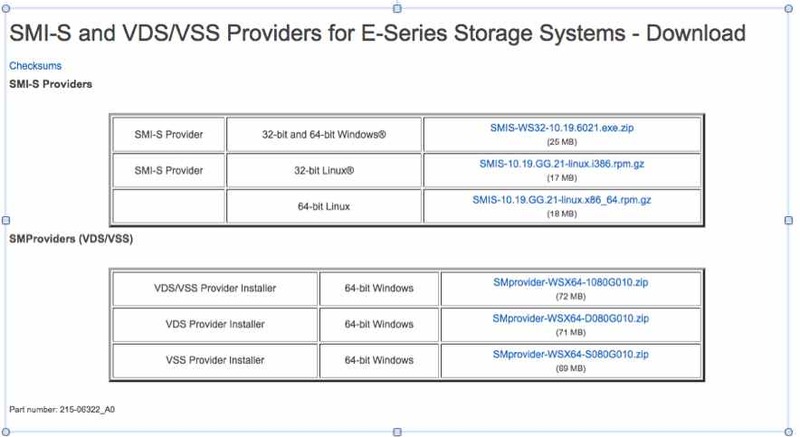 Downloads > Software > Scroll to the E-series Storage Systems drop and select SMI-S and VDS/VSS Providers > Go > View & Download > E-Series Storage System Providers > Accept EULA. Once at the download page, you should see the following for a selection. You will want to select the SMIS-WS32-10.19.6021.exe.zip file for download. Select the array and Monitor it. ***Scalability issues: The maximum configuration recommended for the SMI provider is either 3 storage systems or a total of 512 volumes, whichever is reached first. This is only an approximate limit. If the limits are exceeded, the provider may not be able to generate performance statistics. For best performance of the provider, a minimum of 1 GB heap memory is recommended. I have problem with installation of SMI-S agent to monitor IBM DS4700 array. I have downloaded SMIS-WS32-10.19.6021.exe and installed it on Balance Proxy Server (Windows 2008 R2) as you wrote above. I've founded these recomendations in OnCommand Balance 4.1.0 Installation and Configuration Guide also. But I can't navigate to "C:\Program Files\EngenioProvider\SMI_SProvider\bin" and can't find ProviderUtil.bat anywhere on the disk. The default installation folder on my server is: "C:\Program Files (x86)\lsi\pegasus"
Could you please advice how I can configure SMI-S agent for IBM DS4700?